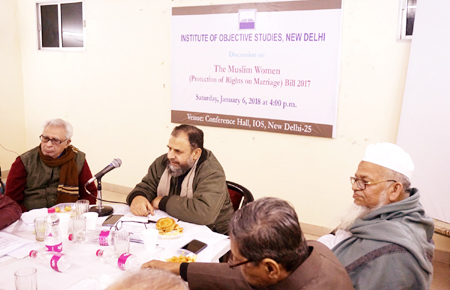 A discussion on the Muslim Women (Protection of Rights on Marriage) Bill, 2017, was organised by the Institute of Objective Studies at its conference hall on January 7, 2018 in which several well-known lawyers, legal experts, ulema and scholars participated. 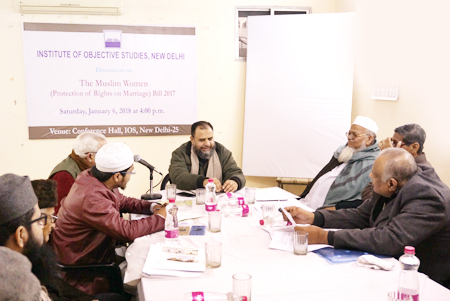 Prof. Afzal Wani, Professor of Law, GGS Indraprastha University and convenor of programme, initiated the discussion by observing that the bill under the consideration of the Upper House was not against the instant triple talaq as such, but was directed against talaq as an institution. The impression being sought to be created in TV debates and in Parliament did not conform to the shariah. He said that the proposed bill clearly provided that the law would be applicable in the case where instant triple talaq was uttered. The bill also covered other modes of talaq which hinted at the real intentions of the government. He opined that the government appeared to be hell bent on snatching away a Muslim man’s right to have the option of divorce if no rapprochement with his wife was possible. 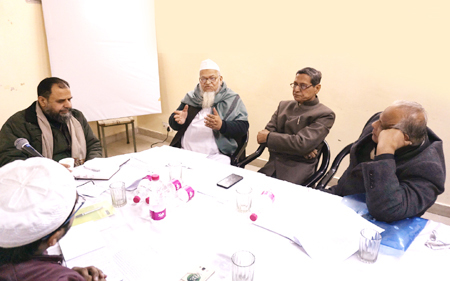 Advocate Tariq held that the bill should be amended to accommodate the triple talaq in one sitting, instead of instant triple talaq, or else, the entire institution of talaq would attract the provisions of the bill. This amendment would not allow the government to defend its stand in a court of law that the legislation was confined to instant triple talaq. 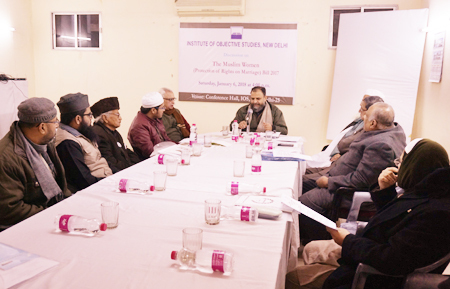 Advocate of the Supreme Court, Asrar Ahmad, Khwaja Abdul Muntaqeem, Member of All India Personal Law Board, Maulana Ateeq Bastavi, Advocate Sheikh Kazim, Zafar Sadiq, Journalist Shamsh Tabrez Qasmi, Mufti Ahmad Nadir al Qasmi, Mufti Safdar Nadvi, Maulana Shah Ajmal Farooq Nadvi, Maulana Anis Aslam and several lawyers present at discussion were unanimous in their view that certain provisions of the bill needed to be amended. They maintained that the law in the present form was biased against Muslim women and effort should be made to rectify such provisions. They held that the bill was pending in the Rajya Sabha, and the period available before the commencement of the budget session of parliament should be utilised to evolve an effective strategy to impress upon the government to amend the obnoxious provisions in the bill. Senior advocate Mehmood Pracha pointed out that Muslim women did suffer at the hands of their husbands and the present bill had brought relief for such women to some extent. However, certain provisions did require amendment. He endorsed the invocation of criminal law against the offenders by likening the provision to the second Caliph of Islam, Hazrat Umar’s (RA) order for flogging of a man guilty of triple talaq in one go. The participants, however, disagreed with his views.